Another great trip with redspokes with fantastic scenary & a great group of people with good support from Ox & his crew. 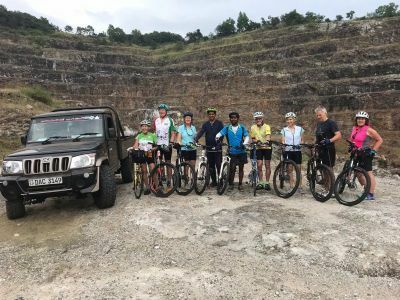 This is challenging tour with at least half of trip more associated with technical mountain biking than road biking as tarmac to rough rocky roads is about 50/50 with tough climbs. Wow - truly awesome trip that i would recommend to anyone!!! Ox was incredible - flexible, organized, responsive - met our every need and tailored the trip to be exactly what we wanted. i hope it was clear from the blog that we were thrilled with the gruelling nature, stunning scenery and what we believe was quite the accomplishment. We couldn't have achieved it without the amazing team. Dorje was exceptionally knowledgeable about Tibet and Tibetan history. He provided incredible information, modified our tours so we could be present for prayers. Thanks! I had never been on a group cycling holiday before so I was not sure what to expect. I am very pleased to say that this was an absolutely fantastic experience. The scenery in both Chile and Argentina was truly spectacular. Cycling beside the huge lakes with the snow topped volcanos was stunning. The two guides Jeronimo and Gustavo were so helpful and friendly. My fellow cyclists from all over the world were really great company and very supportive of each other. The accomodation and food varied from location to location but was always great. I really loved it. I'm already planning another trip.